If you’re in advertising and you title your book “[Your Name] on Advertising” you can be fairly certain that everyone who reads it will know that you’re placing yourself on the pedestal with David Ogilvy and his “Ogilvy on Advertising”, the work that drew a line in the earth for books on this business since it was published more than 30 years ago. To those unfamiliar with the peculiar form of camaraderie that is a hallmark of the agency business, one might think this sort of behaviour would open one up to the slings and arrows of outraged practitioners. Those familiar with how our business works, of course, know that simply opening one’s mouth launches the missiles, so you might as well do whatever the hell you want and let the chips fall where they may. John Hegarty knows this and, as “Hegarty on Advertising” makes pretty clear, he’s never been one to let a little potential outrage get in his way. He would probably say that if you’ve got the chops, you don’t have to worry about it. So the question is, does he – or rather, does “Hegarty on Advertising” – have the chops? “Hegarty on Advertising” is an exceptional book, one that should be required reading by anyone in this industry, and one that will certainly work its way into any classes I teach on the subject. Like many books on the business – “Ogilvy on Advertising” for one, “My Life in Advertising” for another – “Hegarty on Advertising” is one part memoir, one part sermon. Or rather, it weaves the sermonizing into the memoir in a way that not only uses the examples from his own life to prove his points, but it makes the agency he and John Bartle and Nigel Bogle founded in London in 1982 as the logical extension of his thinking and experience (Does this mean that “Hegarty on Advertising” is occasionally a promotional piece for BBH? Of course it does. Does that surprise you? Really? And just how many hours have you been in advertising?). And as useful as the memoir is – explaining how the creative revolution in the U.S. came to Britain and died, how Saatchi and Saatchi grew out of Cramer Saatchi where Hegarty worked, how TBWA came about, what made BMB and CDP so important, and even how BBH started – the real value is in Hegarty’s observations from a career as a creative, business owner and iconoclast. Like when Hegarty writes “You cannot create great work unless a little bit of you goes into it, be it your heart, your soul or your beliefs. Whatever you create – it could be a painting, writing, designing or even advertising – the work that results is an expression of you.” Which I am certain is mind-numbingly obvious to any creative worthy of the title, but is, I have found time and again, actual breaking news for account people, clients, spouses, offspring and anyone else who doesn’t understand why daddy is throwing his desk out the window because someone wanted to change the headline on an ad that is probably just going to be killed anyway. Stop me if any of this sounds painfully relevant to you. Amen to that. And to a lot else in this book. 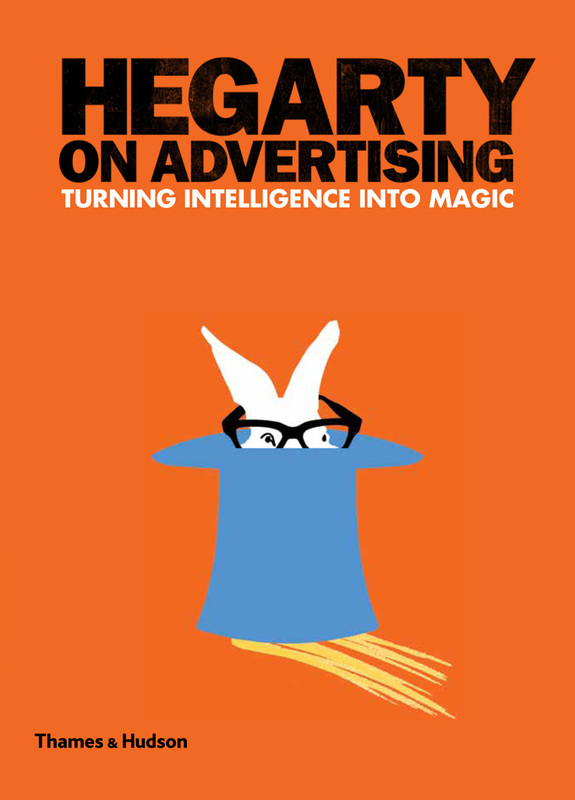 Hegarty on Advertising by John Hegarty, was published by Thames & Hudson on 6/13/11 – order it from Amazon here or from Barnes & Noble here – or pick it up at your local bookseller (find one here). Well done, Martin. It’s good to see someone who’s been through the fire(Hegarty) of the industry and stands today exhorting ad folk to make the most of what is an extraordinary point in the industry’s history. Fantastic to see one of the great guys still have faith in our industry despite the way it seems to work sometimes. It’s people like this who make me stay optimistic as well, hoping more heart gets put into the business we love.